Baptism is far more than getting wet or checking off another thing on our obedience to do list. You see, what saves is Jesus' death, burial, and resurrection (1 Cor. 15:1-5). God has given us the incredible grace (Rom. 6:1,14,15) of being able to share in Jesus' saving work through faith and experience it in baptism (Gal. 3:26-27). We die to the old way of life and bury it in the past. It no longer holds us. This death is the death that matters most. 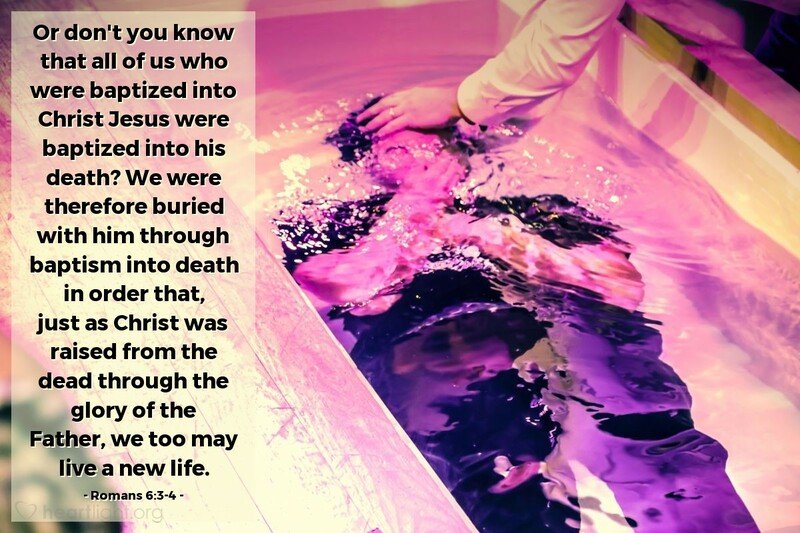 Raised to a new life, our life is now joined to Christ and his future becomes our own (cf. Col. 3:1-4). The life we now live is to glorify God and to live with him forever. That means the Gospel is not just something preached; it is something we experience by grace. Thank you Father, for raising me from death to your new life for me in Jesus. Thank you for your grace in sending Jesus. Thank for your grace in making Jesus' death, burial, and resurrection something I have experienced. May my life reflect your powerful grace given to me. In Jesus' name I pray. Amen.